Well, I survived the 22 degree night in the Walmart parking lot. In preparation of the cold night, I turned my heat on the highest temperature at full blast while driving to Woodville. Even with exiting VANilla to do a little grocery shopping and to let the dogs out, the temperature remained above 50 by the time I went to bed…not bad. The first attraction of the day was the Edward Ball Wakulla Springs State Park. What a pleasant surprise. As I paid the four dollar entry fee, I asked the ranger what he recommended. He said the boat ride on the river because several manatees have been spotted. I was all about that as I’ve only seen manatees on one other occasion and only briefly. The ranger selling the boat tours informed me the boat wouldn’t be going out on the river until the temperature raised above 40 degrees, approximately an hour. She added that the alligators wouldn’t be out due to the cold temperatures. “What about the manatees”, I asked. “Oh, well you can see them right over by the dive platform”, she replied, as she pointed out the window. With only my point and shoot camera in hand, I walked over to the platform that I shared with another couple and snapped some shots of a few solitary manatees. I needed my good camera and also needed to walk the dogs, so I ventured back to VANilla to check on the mutts and upgrade my lense. When I returned to the dive platform a few of the manatees glided over the light sandy bottom directly below the platform. I felt like I was on safari again! I was scampering from one side of the platform to the other careful to lean forward only when the railing was nearby. Oh, how I wished for a warmer temperature. How cool would it be to jump off the dive platform and swim with the manatees. After 45 minutes of enthrallment, I finally pulled myself away to attend to the pups. Before I left for the trail, I checked with the ranger to see if the manatees would remain nearby. I found out the 125 foot deep Wakulla Springs that feeds the Wakulla River is located just below the dive tower and the water temperature maintains a constant 68 to 70 degrees. I thought if I were a manatee in this weather, I wouldn’t venture far from the source of warm water, so I took the dogs for their morning walk and planned to return for one last look. The leaf covered, nature trail wound through a forest of dogwoods, magnolias, pine, cypress, beech, ash and more. We crossed a wooden bridge and continued to the one mile marker before turning around. Upon returning to the trailhead, we inspected the small sink holes nearby for a white cave crayfish known to climb up from the caves to forage for food…no luck…but lots of luck upon my return to the dive tower. The manatees, now clustered together, were like kids in a swimming hole, chasing each other, barrel rolling, dunking each other below the water’s surface. For an hour, dressed in a parka and wool hat, I turned in circles snapping pictures of at least fifteen of these docile creatures either playing with or courting each other! Two hundred pictures later, my nose dripping with snot and my hands so numb that the heat activated screen on my iPhone was unresponsive, I decided to explore another stop along the Florida Panhandle’s scenic drive. Clearly, I skipped the river boat tour, though had the glass bottom boats been operating, I would have taken the ride just to see mastodon bones lodged in the cave entrance beneath the spring. I moved on to Leon Sinks Geological Area located in the Apalachicola National Forest. With three trails to choose from, the dogs and I turned right and shuffled across the sandy trail strewn with pine needles to check out the sinkholes. I was expecting sinkholes similar to the two small ones at Edward Ball Wakulla Springs State Park (which by the way includes a 1937 lodge offering dinner for two, a boat tour, and room for $99 per couple through most of February), but was pleasantly surprised to see large holes, both wet and dry. While the dry ones were merely plant covered ground collapsed beneath its own weight due to rainwater dissolving limestone, the wet ones where collapsed ground met with a water filled cave were truly breathtaking. The cobalt blue Hammock Sink, part of a six room cave system extensively mapped by divers, is large enough to hold a six-story building! Nearby, the sapphire colored Big Dismal Sink, extending to a depth of 130 feet, is the deepest of the sinks in this geological area. This sink is connected to the Floridian aquifer which provides drinking water for millions of people. As I peered through the openings in leaf covered trees, to the sink and fern covered land below, I could hear water trickling from the banks into the sink. Scout, Petey, and I turned back after viewing Big Dismal in order to try another trail that according to the map twisted by swamps. We reached the first swamp to find a dry pit, full of stumpy roots and trees. Given we had probably hiked another two miles, we returned to VANilla to explore Carrabelle. Carrabelle, farther west on Highway 98 that follows the southern shore, is home to the world’s smallest police station, a phone booth! Next to the phone booth, I found my first cache in Florida. I periodically checked for caches, but they were rarely located in the state parks, probably due to the entrance fee, and always just a few miles too far away. Obviously, I could have completed some city caching, but I enjoy the natural setting better. By the time I reached Carrabelle, it was late afternoon, and I had to decide how I wanted to spend another freezing cold night. A few state parks offering camping were located on barrier islands nearby and the closest Walmart, near Panama City, was about 1.5 hours away. Neither sounded very appealing – a wind exposed campground or a parking lot 90 miles away. What a fabulous post Beth! I love Florida and what a treat for you to see the manatees! Thanks. I really enjoyed that day! This seemed like a super cool day…except for the cold temps! It probably would have been a nice spring day for you! As a former resident of both Carrabelle and Tallahassee I enjoyed reading this. 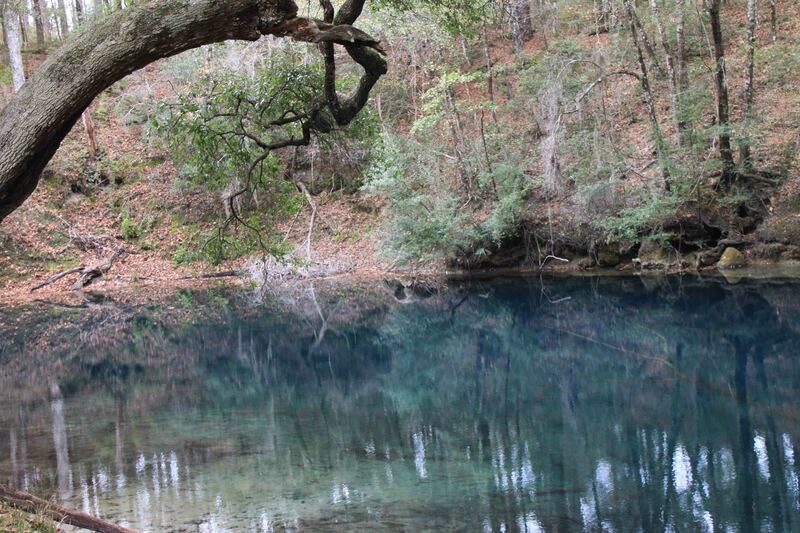 Thank you…I really loved seeing the manatees and the sink holes. I only wish I were there when it was warmer!